Often, substance abuse or other addictive behaviors play a significant role in a client's offense conduct. In some cases, an arrest represents an opportunity for a person to face his or her emotional issues and self destructive behaviors. Throughout her career, Dr. Balkan has steered many clients to treatment centers and recovery programs. 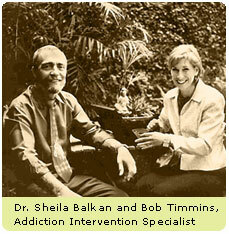 In conjunction with the late Addiction Specialist Robert Timmins, Dr. Balkan has orchestrated hundreds of interventions. Working with addiction treatment programs around the country, Dr. Balkan is well versed in the principals of the 12-Step programs, such as AA, NA, CA and SA. Dr. Balkan is currently working with Interventionist Earl Hightower, a leader in the addiction field and internationally renowned speaker in the recovery community. Dr. Balkan has found that criminal conduct is often the consequence of a dual diagnosis condition, requiring both psychiatric and substance abuse treatment. Her associates include highly competent and experienced psychiatrists, psychologists and therapists. These mental health professionals are frequently able to assist clients to understand and change their behavior as well as demonstrate how psychological and emotional issues contributed to their offense conduct. Simply being accused of a crime can produce profound feelings of shame, doubt and anxiety. As overwhelming as these feelings are, they can also lead to new understandings of oneself. In some instances, the darkest moments in clients' lives have led to long overdue treatment that has been transformative and helped them regain their self-worth. With appropriate resources, many people are able to restore their reputations, self-respect and place in the community. Dr. Sheila Balkan has built on her success in placing offenders in community service to design a model for rehabilitation that addresses the needs for all people recovering from substance abuse. As a consultant for Promises Addiction Treatment Centers, Dr. Balkan has created and implemented a volunteer program to help people in early recovery gain self-esteem by providing valuable service to the community.